Often, new Project Managers, and even some experienced Project Managers, facing the challenge of planning a large, complex project, are overwhelmed by how to get started. I’d like to offer a simplified approach to this daunting task. There is clearly some risk in using simplistic models to perform complex tasks, but I adhere to the philosophy of the much quoted, Mr. George E. P. Box, when he said, “essentially, all models are wrong, but some are useful”. So, keeping in mind, that the devil is in the details, I offer the following thoughts on a simplified approach to project planning. Good project plans are the result of good decisions. Good decisions are the result of understanding context and marshaling, applying, sequencing and controlling the relevant knowledge resources that will execute the project. Understanding context, and bringing to bear relevant knowledge, starts by asking and progressively elaborating the answers to six simple questions. Why? > What? > Who? > Where? > When? > How? 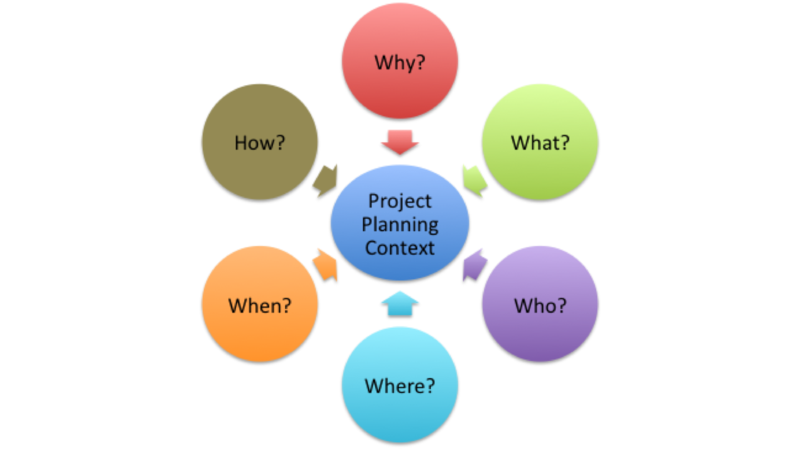 The following is a list of the five basic project context building question categories. I’ve also included some typical; but by no means exhaustive, sub-tier questions that should be asked and answered within each category. • Why? – Answers to these questions provide necessary market, business and personal strategic context for the project and help define the MISSION. – Why does the customer what to do this? – Why does the business want to do this? – Why do I want to lead this project? • What? – Answers to these questions define scope and limits context of the project and establish the SCOPE. – What are the customers project requirements? – What else does the customer want? – What don’t the customers want? – What knowledge resources can the business bring to bear and what is lacking? – What are the critical interim project decisions that must be made? – What project baselines will be formally established and controlled. – What performance metrics does the customer use to determine success? • Who? – Answers to these questions provide the needed knowledge and capability context of the project and define the PEOPLE RESOURCES. – Who within the organization/business has the needed knowledge and capability? – Who outside the organization/business has the missing knowledge and capability? – Who makes project decisions, communications, and customer contacts? • Where? – Answers to these questions provide the location context for the project and define the PHYSICAL RESOURCES. – Where are critical project execution and Supplier facilities located? – Where are project deliveries to be made? – Where is the project team going to be located? • When? – Answers to these questions provide the timing and sequencing context for the project and define the SCHEDULE. – When must the project be completed? – When must the critical interim project decisions be made? – When are project resources available and unavailable? • How? – Answers to these questions provide the execution process context for the project and define the Execution, Monitoring and Control Processes. – How will customer, business, and team communications be performed? – How will decisions be made? – How will project performance be measured? – How will project baselines be controlled and changed. – How will problems and conflicts be resolved? The iterative elaboration of the answers to these, and other questions that may be relevant to your project, form the Project Plan. If your answer to any of these questions starts with “it depends…”, then you need more context. A thorough and thoughtful plan is a necessary, insufficient, ingredient for a successful project. I’ll offer my thoughts on other critical project success ingredients in future blog-posts. This entry was posted in Best Practices, Better Thinking, Leadership, Program & Knowledge Management, Project Management, Project Planning and tagged project decisions, Project Managers. Bookmark the permalink.